The growth of civic engagement manifests itself in a number of different ways: in the form of “white ribbon” movements, and in the electorate’s willingness to observe and take part in voting. Source: PhotoXpress. Sociological research shows that Russians are taking more of an interest in politics. Experts think citizens have been inspired by the recent political protests in Russia’s big cities. Russians have started to pay more attention to the democratic processes that are happening within the country. According to sociologists working at the All-Russian Public Opinion Research Center (VTsIOM), over the past three years there has been a marked increase in civil interest toward municipal and regional elections. Although turnout remains lower than 50 percent, the actual election has become more important for Russian people. In October 2009, for example, only 34 percent of respondents saw the elections as a significant event;but according to the results of a single general election day held on October 14, 2012, this figure had jumped to 40 percent. At the same time, 43 percent of respondents were convinced that the ordinary voter had little effect on the overall election results (this opinion was held by 45 percent of respondents in October 2009). VTsIOM established that, during regional elections, the most active people were supporters of the parties with no seats in parliament (75 percent turnout). Among political parties represented in the State Duma, the least disciplined were the supporters of the leader of the Liberal Democratic Party of Russia (LDPR), Vladimir Zhirinovsky. Only 41 percent of LDPR supporters showed up at elections, while the turnout for supporters of other parties represented in parliament was around 58-59 percent. Experts chalk these results up to a marked increase in civic engagement over the past year. 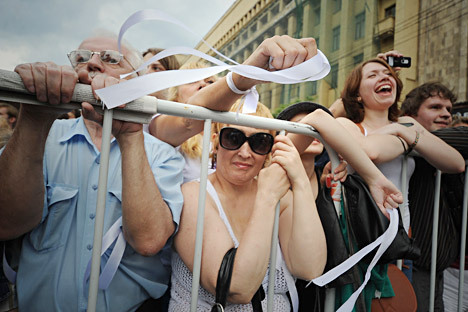 According to VTsIOM’s general director, Valery Fedorov, “The growth of civic engagement manifests itself in a number of different ways: in the form of “white ribbon” movements, and in the electorate’s willingness to observe and take part in voting (including in local government elections).” However, the expert says that much of this is thanks to the activities of the parties themselves. “Before this, only United Russia and the Communist Party of the Russian Federation (CPRF) played an active part in regional elections. After introducing municipal filters and liberalizing the process for registering parties, there are now a larger number of candidates who take part in local elections. This has helped to stir up the interest of both the parties and ordinary voters,” said Fedorov. The president of the Institute of National Strategy, Mikhail Remizov, suggests that, while United Russia supporters could mobilize voters more actively, it is possible that the opposition could also work more actively with the protest electorate. “It seems likely that the ‘average’ turnout will remain the same in the next elections, since there are still no grounds for a noticeable change. It is important to avoid a failure in turnout, as happened in Vladivostok or Kaliningrad – i.e., in cities where interest in politics among the citizens is high. In such cases, the low turnout indicates that the elections are being sabotaged,” said Remizov. The opposition parties themselves suggest that the data obtained by VTsIOM reflects failures in Russia’s political reforms.